Express your true feelings of love and companionship you feel every day for your best friend through a Personalized Picture Frames. 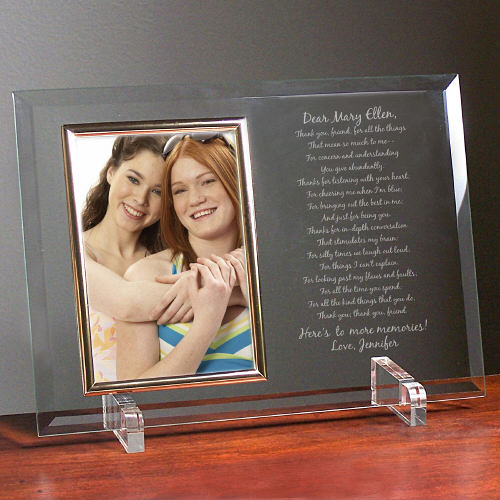 These beautifully engraved glass Customized Picture Frames offer the framework for your precious words of appreciation along with a favorite photograph. The perfect friend gift for birthdays, weddings, anniversaries or simply just because you want to send a personalized gift. Your Personalized To My Friend... Beveled Glass Picture Frame is a heavy-weight glass with beveled edges on all sides, accented with golden brass frame trim. Frame measures 8" x 11" and holds your 4" x 6" photo; includes clear easel legs for top display. Includes FREE Personalization! Choose from our poem... To My Friend and personalize with any opening sentiment and any two line message after the poem or Create Your own Poem, up to 20 lines. It looks identical to the preview they give you before you place your order. I am very pleased with this product. I ordered the frame for my friends birthday gift. I love it. It is so nice. I know that she will love it also. i will be ordering from your company again. Thank you so much. Personalized Photo Keepsakes make great photo gift ideas for Mother's Day, Father's Day, Christmas Gift ideas and Grandparent's Day. Create your very own Personalized Picture Frame for your special Grandma, Mom, Sister, Dad, Brother or best friend.